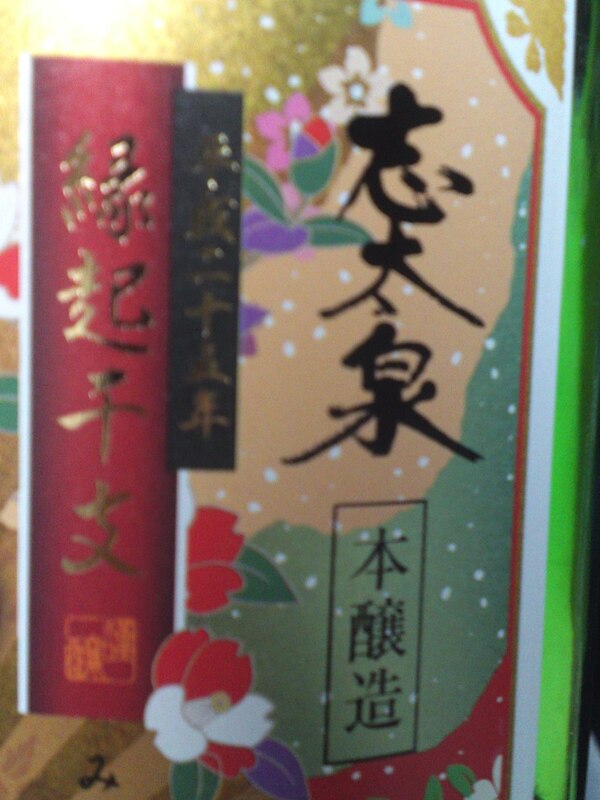 Shizuoka Sake: “Homare Fuji” Sake Rice Actively Promoted Locally and Nationally! Shizuoka sake brewed with Homare Fuji Rice being tasted at “Shizuoka Green Tea Plaza, Tokyo Prefectural Tokyo Tourism Office in Yuraku-Cho, Tokyo. On the 13th of December no less than 20 Shizuoka Breweries, including internationally famous Doi (Kaiun) and Hatsukame Breweries, organised a tasting feast in Tokyo at the “Shizuoka Green Tea Plaza, Tokyo Prefectural Tokyo Tourism Office in Yuraku-Cho, to actively promote sake made exclusively with Homare Fuji Sake Rice first developped and grown in Shizuoka Prefecture, a feat noteworthy for its uniqueness in the very traditional world of sake brewing in Japan! On the Prefectural scene many breweries are active promoting sake made with Homare Fuji rice such as Kanzawagawa Brewery (Shosetsu) which has been organizes brewery viewing and sake seminars since 2005 on a regular basis! 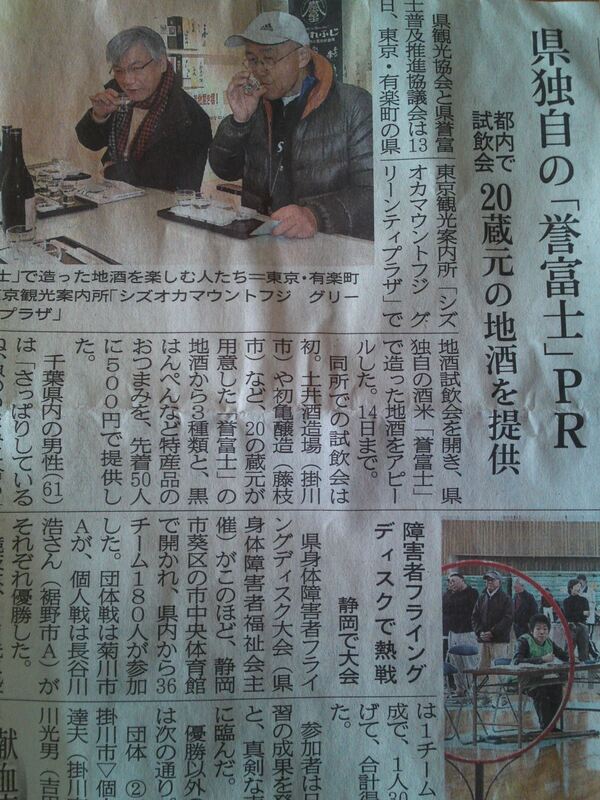 This year no less than 49 sake lovers participated to the latest seminar! Knowing the brewery well, the establishment must have been really crowded! At least the future of Japanese sake is quite rosy here in Shizuoka Prefecture! Shizuoka Sake: A New” Brewery Born: Hiraki Shizuoka Brewery! 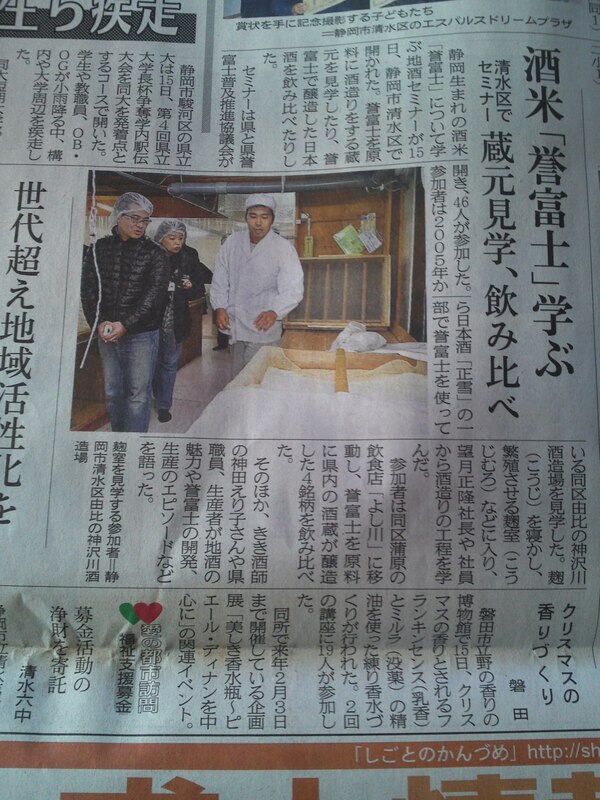 A”New” sake brewery is born in Shizuoka City! Hiraki Company in Shizuoka City, a company with roots back in Edo Period, the biggest distributor of large spirits and drinks companies in Shizuoka Prefecture had momentarily moved from Kakegawa City in Shizuoka Prefecture to Okayama Prefecture in 1956 to acquire Hiraki Brewery while the law permitted it. They consequently moved back to Shizuoka City in 1967 to expand their business as the local distributor for big corporate companies producing drinks and spirits. Naturally, they sold their sake brand called Kihei (and still do. “Kihei” actually is the inverted name of “Hiraki”!) in Shizuoka Prefecture and were also very active in offering contracts between the local sake breweries and the big companies in Nada (Kobe area) to produce sake to the latter according to their requirements. According to them they decided to produce sake again in Shizuoka Prefecture after a 45-year lapse (I think dates are manipulated there, but who am I to say?) after the new sake rice brand, namely “Homare Fuji” was recognized as such by the Shizuoka Prefecture and the Ministry of Agricultre and Forestry. 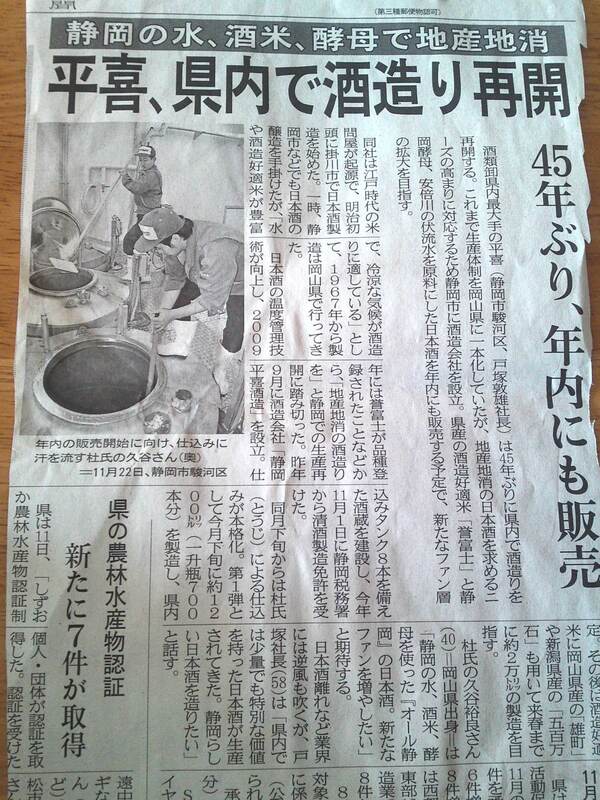 In 2009 they applied to the Japanese Tax & Excise Bureau after acquiring the license of Sogatsuru Brewery in Kakegawa City which had kept it (they had actually lent it to Hagi No Kura Brewery, presently Suruga Brewery for a while) ever since they stopped all activities more than 10 years ago. Although you are not supposed to buy it, but just acquire it, I know from reliable sources that Hiraki Company obtained the license for 30,000,000 yen…. 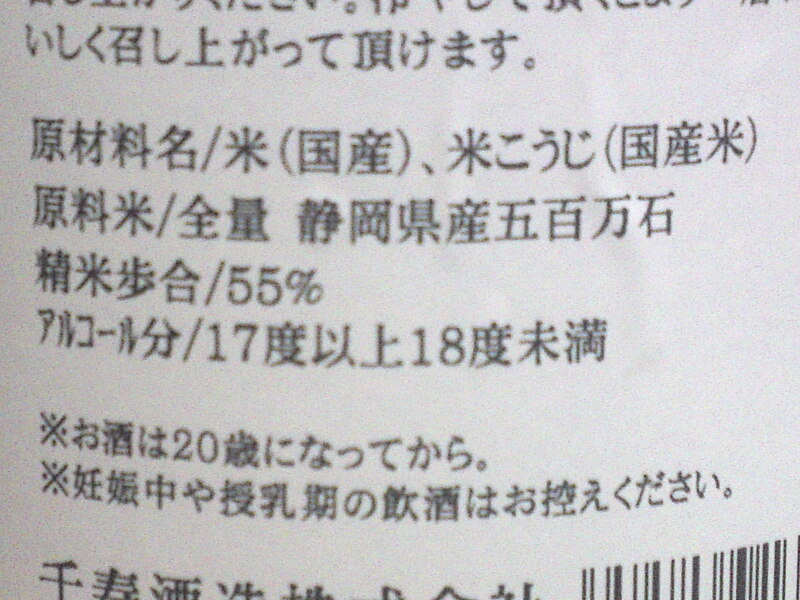 On the 1st of November 2012 they obtained permission from the Tax & excise Bureau and starting making sake end of November. They have moreover announced they are brewing real “Shizuoka sake” (although they have admitted they will also produce sake from other brands of sake rice from other Prefectures) with Shizuoka-grown Hoamre Fuji rice, Shizuoka yeast and Shizuoka water from the Abe River basin. They have officially become members of The Shizuoka Prefecture Brewers Association and their sake will be on display at the next Shizuoka Sake Tasting Fair in March. Shidaizumi Brewery in Fujieda City holds this great tradtion to @roduce a honjozo with a beautiful label every year for the coming Japanese New Year! 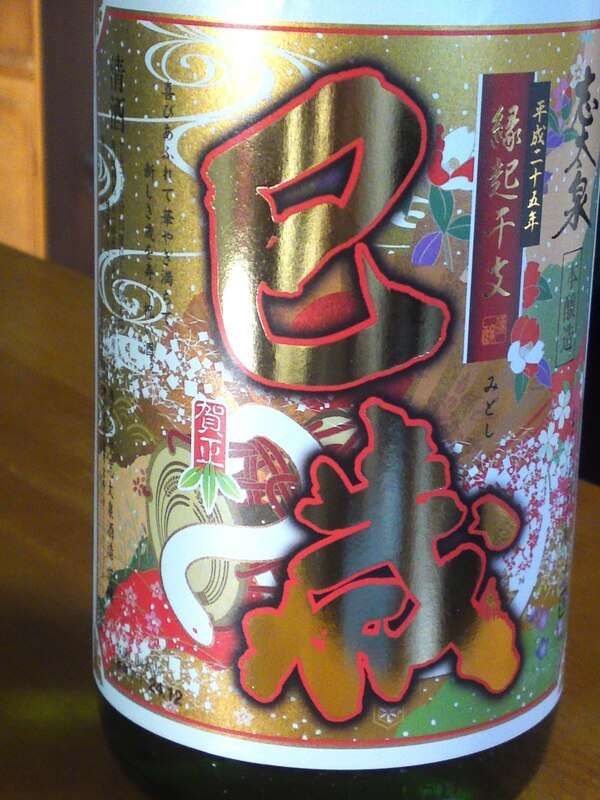 Next year will be the year of the Serpent (Snake), that is Midshi/巳歳 in Japanese as you can see on the label! Taste: Dry and very fruity attack. Alcohol pleasantly warming up back of the palate. Lots of nuts including almonds and macadamia nuts. Banan. Lingers only for a little while with a very pleasant aftermath. Drinks easily and insistently calls for the “next cup”. Take a drier turn with food with strong hints of coffee beans. Makes a quick comeback to fruity, almost sweetish attack back with plenty of nuts and stronger banana once away from food. Overall: A sake designed to be enjoyed at length. Although obviously conceived to accompany food, I enjoyed it best slightly chilled on its own. Would make for a great nightcap! Or even an afternoon drink in summer in spite of its being designed for the cold weather at the turn of the year. Personally I would be very willing to drink it with very strong cheese! On the Japanese Gastronomic theater it perfectly marries with o-shinko/pickles and heavy izakaya cuisine! Senju is a small but remarkable brewery in Iwata City, Western Shizuoka Prefecture, and it is not always easy to get their brews here in Shizuoka City, but for fortunately Matsuzakya Department Store has endeavored to make them known recently! Since I found this junmai ginjo genshu, meaning it went through through no moderation, be it pure water or pure alcohol, I had the occasion to taste the original sake of the brewery! 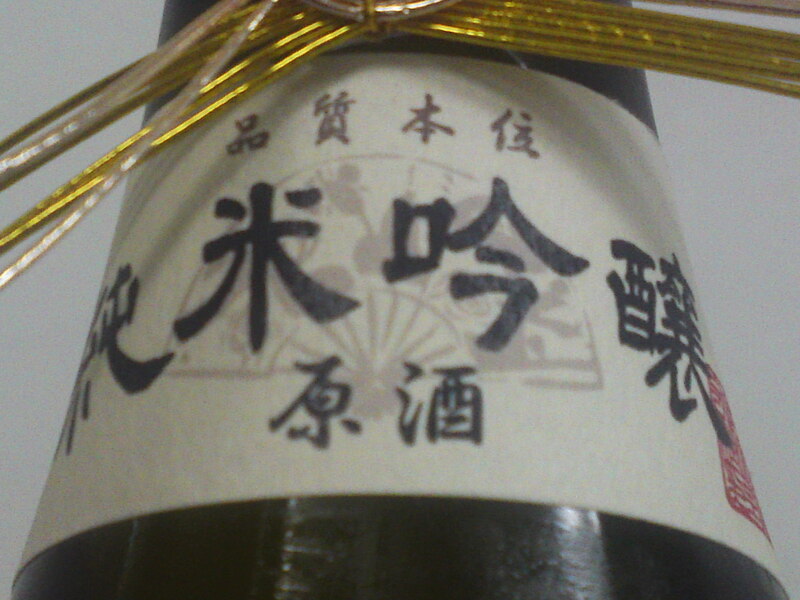 Moreover, since the rice was grown in Shizuoka Prefecture, it makes for a truly local sake! Aroma: Strong and pleasant. Alcohol. Chestnuts. Grilled nuts. Tasting: Very dry attack backed by puissant junmai petillant. Very pleasant first impression in spite of the high alcohol content warming up the back of the palate. Complex and fruity. Very difficult to “catch”. Nutty, dry roasted nuts, yoghurt. Disappears very quickly on a drier note. Varies little with food, although tends to take a slight turn to sweetness then. 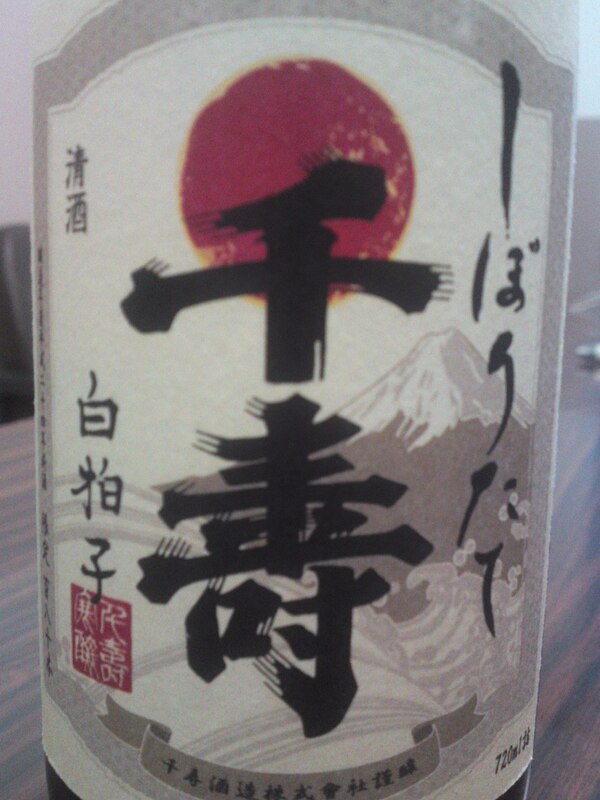 Very unexpected taste and flavors for a Shizuoka sake. Overall: An unusual sake for Shizuoka Prefecture, both in approach and taste. Dry but complex, puissant but elegant, very difficult to catch. Fleetingg, mysterious. Although macho in approach, will attract ladies in particular for its fleeting character. Although eminently enjoyable with food it will probably best appreciated on its own slightly chilled. Could be served as a beautiful aperitif, too!